I wake up from a dream, feeling lazy and wondering where I had been that felt so real, and now in bed, soft, warm and back in the physical body again, kind of relieved and confused. I’m still aware of the emotions from the night and new feelings and thoughts flood me as I rise this body out of bed ready to live another day! It’s amazing to be human, and it’s complicated with all the different parts of me to understand. In knowing I can navigate and connect these parts, I feel open to whatever life offers me. The knowledge from yoga and how it correlates with my learning from Nonviolent Communication (NVC) about the Mind-Body continuum, basically about who and what we are, empowers me every day. I like the idea of a continuum because that means an uninterrupted spectrum of being. It gives me a sense of wholeness even within the diversity of all the parts. The mind-body continuum is grounded in the body at one end and goes to the subtle, non-physical parts at the other without any breaks in between. Most models of looking at the continuum of the human being agree that the body anchors one end, grounding us in the physical world and holding us down on the planet since it is the only part of us affected by gravity and that ineracts with matter. At the other end, where things get more subtle and difficult to define we don’t find the same uniformity. I like to start with the spectrum from the point of view of the mind since I am writing this now from my mind, and presumably you are reading it with your mind. This means the spectrum in order from conceptual to non-conceptual. I am aware that there are myriad psychological, philosophical and spiritual perspectives about what is the mind. My purpose here is not to enter this fray, although I might not be able to avoid it completely, my purpose is to describe a frame of understanding ourselves that we can use practically in our everyday relationship with ourselves, our experiences and others in our lives. Therefore, I will write from my own experience of mind, body and soul processing in different meditations, mindfulness and therapeutic experiences I’ve had. I define the mind as the space of perception, thoughts, concepts, language, images, imagination and fantasy, memory, judgement and discernment. I don’t include emotions and consciousness because I can continue to be aware and feel when my thinking stops, so I find this distinction helpful especially when we approach emotional healing and spiritual growth. The mind is the mental space where we tell ourself stories and speculate about the future and the past. Only the mind can do this time travel in thoughts like “if only I had…” and “what if she would…” and ends the phrase with “then I’d be happy”. This capacity to be with the past and future gives us an important opportunity to learn from our experiences and to plan and predict our outcomes. The mind is an amazing tool to understand ourselves and the world, and it gives us the capacity to share these understandings with each other especially through language. At the same time, the mind is not what holds our deepest sense of worth, meaning and purpose. I like to think of the mind as a translator. It receives the impulses from the emotions which say in one way or another “there’s something moving me, there’s something really important going on,” and these in turn are pointing to a deeper layer of our being. When these parts are connected the mind can give a faithful rendering into language of our feelings and values so that our depth can be shared by others and we can include others in our sense of fulfilment in life by asking them to contribute to us and finding out what we can do to contribute to them. When there is an inner disconnect, then the mind will still give messages, it is the spokesperson of the being, just that those messages will be reduced to a mental, conceptual content, they might not even be true for us, or really aligned with our values, and in conflict situations these messages often come out as judgements and blaming and then lead to outer disconnect as well. That’s where the navigation of the continuum becomes important. The first distinct level we all experience “between” the body and mind is the feelings/emotions level. I like to call this the heart space, so when we say let’s have a heart to heart we mean let’s connect and share what we are feeling. There are researchers who make the distinction between emotions and feelings. Emotions are the instinctual body reaction to stimuli such as fear when threatened and they have an objective physiological nature and are common across cultures. Feelings are already a personal and mental interpretation of the emotional experience and become much more nuanced. There are also other ways to look at feelings and emotions, and for my purposes I will use these words interchangeably without going into this distinction. The experience of feelings can be a powerful, even overwhelming one. Feelings are the main driving energy behind our motivations, they fuel the intensity and persistence of our thoughts, and they are the first bridge from the subtle levels with our physical bodies. Feelings are strongly connected with the mind, our thoughts affect and create feelings, and our feelings stimulate and maintain our thoughts. We can easily get into a feeling thought loop when, for example, our frustration stimulates judgements which perpetuate the frustration, etc. There are certain feelings which are thought dependent such as anger – “something should be different”, guilt – “I did something wrong”, shame – “I am wrong in someway”, and depression – “I cannot meet (all) my needs”, are known examples. While the mind interacts and can become entangled with feelings, it is not the only way we experience them. Feelings almost always relate to some sensations in the body, and this is an important Mind-Body link. There are several therapeutic processes that use the somatic (body) experience of the emotions to support having an emotional experience distinct from the mental one because it is often very difficult to experience feelings directly without the story in our mind that goes along with them. Especially when feelings become too intense for the mind to hold them and we get overwhelmed, focusing on the body and trusting the body to hold them through the sensations can bring presence to the experience. The body sensations also help us stay with a feeling long enough and in the present moment to be able to decipher its deeper origins instead of going to avoidance mechanisms that are often built into the mind and its storytelling. Beyond the healing aspects of feeling feelings directly or with the body, this is experience can also be a doorway to presence for other kinds of growth. Different meditation processes work with the feelings and being with them without responding to them, or before making a conscious choice to respond, can be essential to cultivating equanimity. Also the Vijnana Bhairava Tantra, an ancient Indian yoga treatise, describes a technique for enlightenment through the direct non-conceptual experience of intense feelings (Sutra 101). Neither the body nor the mind, however, are the source of the feelings. Feelings arise to tell that something matters, something touches us and moves us in a way. The base feelings about survival are so strong because our life matters to us. So feelings come from and point towards what we value or what we need as we say in NVC. To be able to move through the emotions and effectively process the energy they are holding, it helps to connect them to the underlying values that cause them. This connection does not need to happen in the mind, although sometimes that also really helps because the mind can connect by naming them. It can also happen, however, directly through the “felt sense” experience of our needs and values. The felt sense is the pre-verbal, non-conceptual feeling/sensation of meaning. Emotions only arise when triggered by something we consider important in some way, and the felt sense is the space in which we hold the present moment experience of what is important to us before the mind has labeled it with language and before the emotions have translated it into feelings. I call it the soul space because our deeper values are a reflection of our essence, that core part of us that has the innate qualities of love, creativity, authenticity, freedom and truth. We are born with this essence, and one way to check whether we are referring to a genuine need is to ask if babies have it. Needs are the requisites for a flourishing human life just as a plant needs sunlight and water, a human needs sunlight and water and other elements at physical, emotional, mental and meaning levels. The body usually signals us at the physical levels, and the felt sense signals us from the emotional to meaning levels. The term “felt sense” was coined by Eugene Gendlin in the 1960’s after studying what leads to progress and a shift during therapy. He found that people in talk therapy who would pause between sentences or even in the middle of there sentences in moments of reflection that would last several seconds at a time would tend to have more movement in their emotional processes. He wondered what happens in that time and discovered that people can have a direct contact with their values that doesn’t involve the mind or emotions. Contact with the felt sense may be completely unconscious because it occurs in a way most people are not used to paying attention to, and, by definition, it is very difficult to describe felt sense experiences in words. This contact is still very important to any kind of emotional healing because this is where the movement happens. It is also related to the source of inspiration and intuition which are other forms of non-conceptual experiences of meaning that then gets translated by the mind into thought and language. This is where great art and poetry come from, and some of my favourite is from Rumi who captures a meaning with words that I feel palpably beyond words. The physical body is perhaps the easiest to define and investigate since we can see it, poke it and prod it. We also know a lot about how to keep it healthy and how important health and exercise are for the mental-emotional well-being. It is at the end of the spectrum from conceptual to non-conceptual because it has very little capacity to make sense of its experiences, it simply reports through sensations raw data that we interpret with the mind-emotion levels. These sensations can be very helpful in staying present with ourselves, as I noted under feelings, especially when facing intense emotions. Body positions and breathing are also well known for affecting our emotional and mental levels. In fact, this is one interpretation of how and why yoga and other body integrating self-development approaches work. 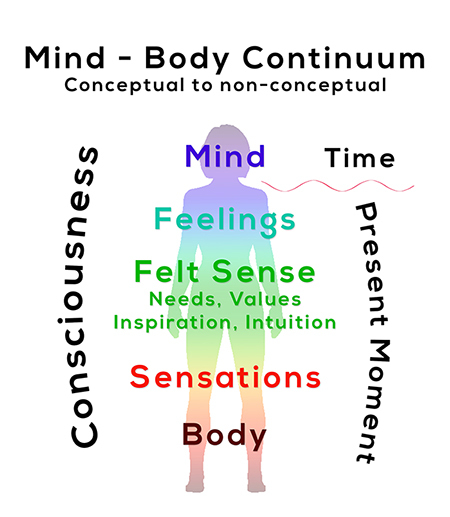 What the Mind-Body continuum describes is a way of knowing yourself. This knowing can stay at a mind level and be the words and the concepts of what a human is. It can also become a full experiential journey in which we are present to ourselves at all these levels. This capacity to connect and be present with our bodies, feelings and values opens a range of choices that are not present when we are lost in thought alone. Being able to see our mind for the storyteller and translator that it is, gives us the possibility to choose how we engage our thoughts: we can believe them if it serves us, we can also observe them with interest or even hold them with compassion and empathy using the heart space to hold the mental space. I believe that an open navigation of the mind-body continuum gives efficiency and movement to any therapeutic process or any process of personal growth including spiritual practices. My work in yoga and nonviolent communication focuses on accessing and integrating these different parts towards wholeness, authenticity and awakening!